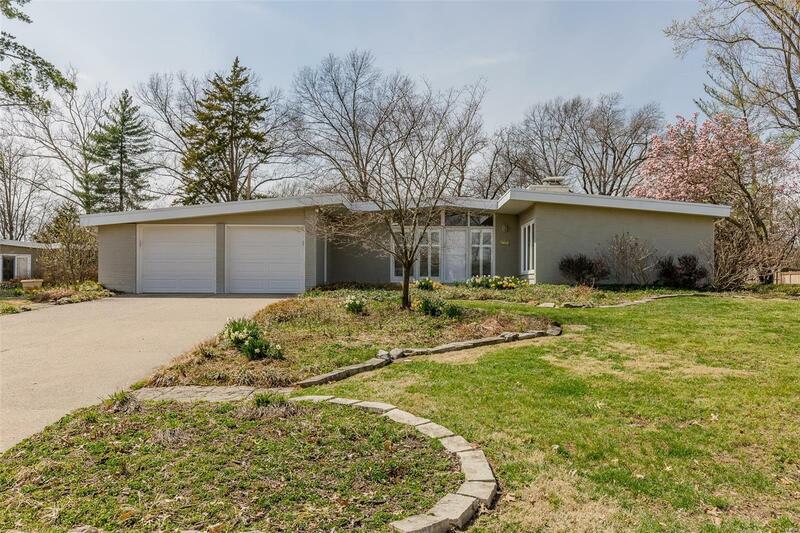 THIS CLASSIC MID CENTURY MODERN (MCM) w/KIRKWOOD CHARM ON NEARLY 1/2 ACRE w/BLOOMING BEDS, BIRD BATHS & BOUNTIFUL MAGNOLIAS..SO MUCH TO LOVE & ENJOY IN THIS NEIGHBORHOOD, PARKWAY SCHOOLS/TAXES & HISTORIC BARRETT BRAE SUBDIVISION W/LOTS OF FUN FOR ITS' RESIDENTS..COME SEE THIS 1888SF, 3BDRM, 2BA HUGE RANCH w/MAIN LEVEL LIVING (NO BASEMENT ISSUES! )..GREAT ARCHITECTURAL LINES; DINING, LIVING RM w/PLANTATION SHUTTERS, NEWER WOOD LOOK FLOORS '16; WRAP AROUND GAS VENTLESS FIREPLACE; SETTLE INTO A HUGE FAMILY ROOM WHICH ADJOINS THE CHEERY & LIGHT FILLED SUN ROOM w/HOT TUB PAD; THIS IS PERFECT FOR STAR GAZING OR A GARDENING BENCH! KITCHEN, MAIN FLR LAUNDRY. ALONG W/3 BEDROOMS & 2 FULL BATHS; NICE 2CAR GARAGE, AGGREGATE DRIVE, STORAGE CABINETS GALORE, NEWER ROOF '16 & GUTTERS '15, NEWER HVAC '16 (CONVERTED TO FORCED AIR GAS), NEWER WINDOWS & BRIGHT SUN ROOM FLOWS OUT TO BRICK PAVER PATIO w/READY TO BLOOM BEDS..ALL THIS UNDER $150/sf IN KIRKWOOD & READY FOR YOUR MID CENTURY FINISHES!